A comic look at the fall of the Berlin Wall in November of 1989, told from the point of view of the German border guards at the checkpoint where it all started…www.imdb.com). 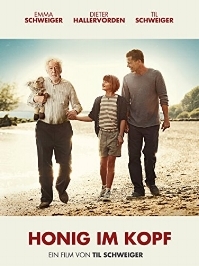 Tilda takes her beloved grandfather on one last adventure before he is put in an old people's home due to Alzheimer's disease. Aristocratic sisters Charlotte and Caroline both fall in love with the controversial young writer and hothead Friedrich Schiller. Defying the conventions of their time, the sisters decide to share their love with Schiller. What begins playfully, almost as a game among the three of them, soon turns serious as it leads to the end of a pact (www.imdb.com). Gudrun joins rebellious Andreas Baader, pro-violence cause and Bernward risks his sanity by using psychedelic drugs in his struggles to finally write the novel committed to changing the world... Based on the emotional true story of an explosive era (www.imdb.com). brings him to the attention of powerful Nazis. He predicts their rise (good propaganda for them) and their violence (not so good). He;s in pain and at risk. What is Hanussen;s future? (www.imdb.com).